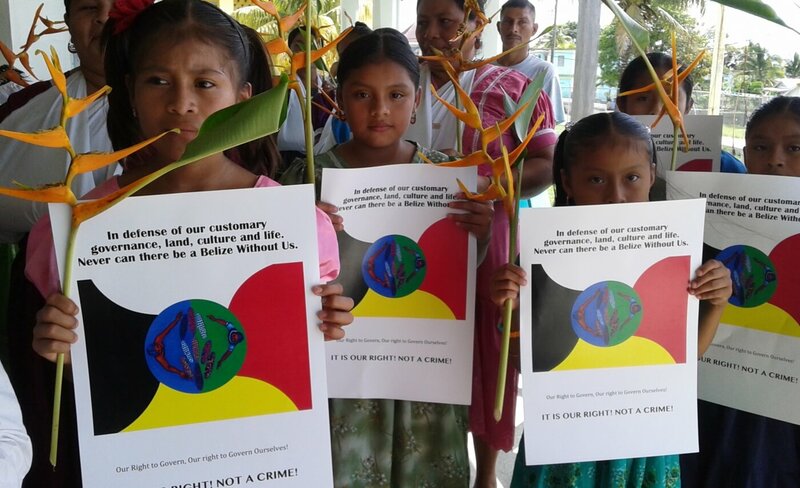 On the early morning of June 24th, 2015, traditional leaders of the Maya people of Southern Belize were violently awoken in their homes by police. Charges were brought against 13 people, including 10 farmers, two traditional Maya leaders, and Q’eqchi community spokesperson Cristina Coc, advisor to the traditional leaders and mother of two. The Maya leaders’ alleged crime relates to the defense of the Uxbenka archaeological site, a sacred site to the Maya people, located within traditional lands titled to the Maya people under national and international laws. The disputed conflict arose after Mr. Rupert Myles, a Belizean citizen, illegally constructing a house on the grounds of the ancient temple against the advise of the community. According to the Maya community members, the Belize authorities failed to respond to their call to stop Mr. Myles from doing further harm to the site. The community explained that Mr. Myles was invited to a community meeting to resolve the conflict where he became unruly and village police detained him. However, Myles later accused the Mayas of physically assaulting him at the community meeting, a claim the Maya leaders strongly deny. Since 2007, Santa Cruz have legal customary ownership of customary lands, where Uxbenka is located, as result of a decision from the Supreme Court that the government of Belize never contested. To date, the government has not taken an steps to protect the property rights of the Santa Cruz Mayas in accordance with their customary land tenure system. Recently, the Caribbean Court of Justice handed down a judgement ordering the government of Belize to demarcate and register Maya village lands, and to protect them against incursions by outsiders. ‘’The Santa Cruz conflict and subsequent arrests is a direct assault to the spirit of the court order, and shows bad faith engagement by the government,’’ explained Program Coordinator for the Maya Leaders Alliance, Pablo Mis. The laws of Belize prohibit building on or damaging any archeological site. In May 2015, a letter was sent to the Belize Institute of Archaeology (NICH) from the Director of the Uxebnka Archaeological Project, in which he expressed his concern that Mr. Myles had: “bulldozed into the archaeological platform (…). He has also built new buildings, and has burned vegetation to the very edge of the steel plaza, further endangering the ruin. The bulldozing activity has irreparably damaged the platform.” However despite this, since the charges were brought, Belizean authorities have continued to allow Myles to maintain construction and ongoing desecration of the archeological site held sacred to the Maya. The Maya leaders stand by their actions. Indigenous People’s right to defend their sacred sites is backed by the UN Declaration on the Rights of Indigenous Peoples. Article 11.1 states that Indigenous Peoples have the right to protect past manifestations of their cultures, such as archaeological and historical sites. Article 11.2 requires States to provide redress with respect to their cultural property taken without their Free, Prior and Informed consent or in violation of their laws traditions, or customs. “The Maya villagers will continue to defend these cultural heritage sites that are important to all Belizeans,” explained the Maya Leaders Alliance in a press release. Friends of Santa Cruz 13 are urgently seeking funds to cover legal counsel to defend their 13 community members on March 30th. See their call for donations here. This article was originally published at Cultural Survival. It has been re-published at IC with permission.